Kiwifruit grows as vine. It can reach the size of 10 meters (33 feet) in length. Kiwifruit has dark green heart-shaped leaves that are spirally arranged on the stem. Kiwifruit can produce fruits up to 30 years and to survive more than 50 years. Each plant of kiwifruit develops either male or female reproductive organs (dioecious plants). Two types of plants need to grow close to one another to ensure successful pollination and production of fruit. The kiwifruit was first found growing in China, where it was known by the name “Yang Tao”. Bees are main pollinators of kiwifruit. Farmers sometimes pollinate kiwifruit on their own by spreading large quantities of pollen toward the female plants. 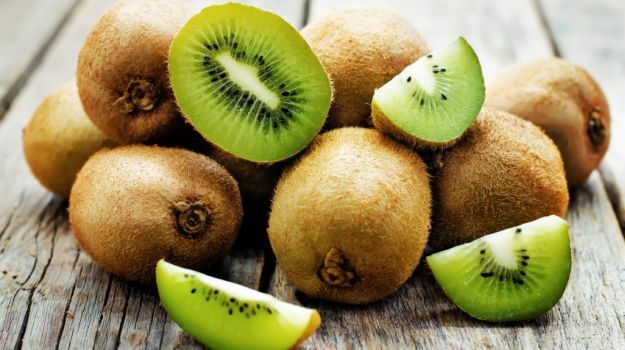 At the beginning of the twentieth century, missionaries brought the fruit to the island of New Zealand, where it received it’s name “kiwi” after the small flightless bird native to the island. Botanically, kiwifruit belongs to the group of berries. Kiwifruit has brown fuzzy skin, bright green flesh and circle of dark seeds in the middle of the fruit. Main pollinators for kiwifruit are bees.Farmers sometimes pollinate kiwifruit on their own by spreading large quantities of pollen toward the female plants. Size, color of the skin, color of the flesh, taste and texture of kiwifruit depend on the species. Hairless varieties of kiwifruit are also commercially available. Kiwifruit grows as vine. It can reach the size of 33 feet in length. Domesticated varieties of kiwifruit require seasonal pruning. Over one million tons of kiwifruit are produced each year. Majority of kiwifruit is produced in Italy, New Zealand and Chile. against free radicals, harmful by-products produced in the body. Kiwifruit contains two times more vitamin C than oranges. It is also rich source of vitamin E and K. Compared to other fruits kiwi offers the greatest amount of vitamins and fibers per gram of fruit. Medium-sized kiwifruit contains only 46 calories. Kiwifruit is usually consumed raw or in the form of juices. It can be also used as part of cakes, ice-creams and other desserts. High temperature (during cooking) changes the taste and color of kiwifruit. It also contains good amounts of minerals like manganese, iron and magnesium. Kiwifruit is prone to bacterial disease induced by Pseudomonas syringae actinidiae. Kiwifruit can help improve the function of your immune system . Kiwifruit can trigger allergic reaction in sensitive persons. Symptoms of allergy can be severe enough to require medical intervention. Medium sized kiwifruit contains only 46 calories. Kiwifruit facilitates food digestion and boosts immune system. High level of vitamin C in the fruit can prevent development of flu. Italy, Chile and New Zealand. Kiwifruit is often consumed by animals such as monkeys and deer. Size, color of the skin, color of the flesh, texture and taste of kiwifruit depend on the species. Hairless varieties of kiwifruit are also commercially available. Kiwifruit contains protein actinidain which softens the meat. Same protein digests proteins in milk and gelatin and prevents solidification of desserts (induces "melting" of the cake). Eating two kiwifruits an hour before bedtime will help you fall asleep quicker. Sleep more soundly and feel better tested when you wake up in the morning.